Anyone trying to build a house or an apartment must have a set floor plan. 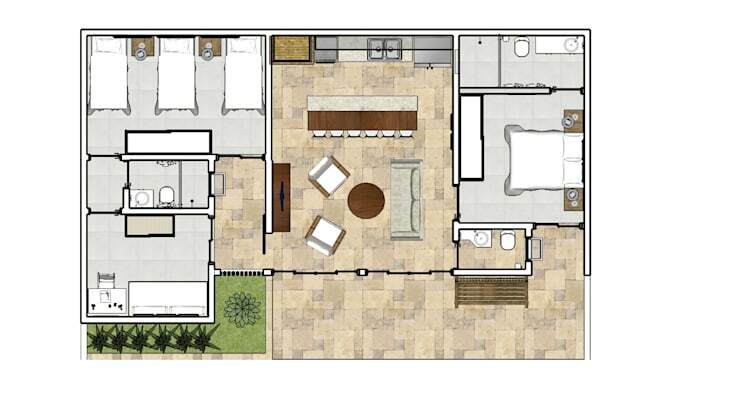 A floor plan is a drawing or digital image of the spatial conditions. With the help of house floor plans, one can easily identify the spatial distribution of the building. Along with this, it will also give you an idea regarding where the bathroom, kitchen, doors, and windows need to be placed. Also, a floor plan can help you to figure out the technical dimensions of the house, which can come in handy while deciding the furniture. 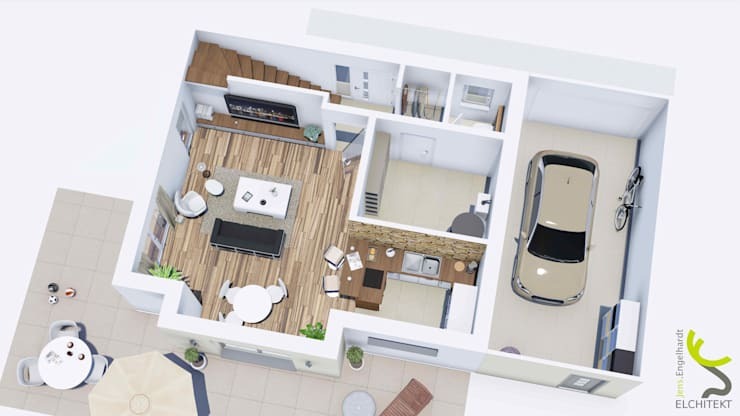 The advantage of floor plans with room size in square meters is that it provides an excellent visual presentation of space. Such house floor plans for modern families also allow you to welcome your guests in the large hallway. Instead of creating a cellar the house has a utility room where one can easily place their washing machine and other service items. Also, the living room can be extended by opening the connecting wing doors near the study area. It is important that a floor plan showcases the placement of doors so that the furniture can be placed in a better way. Along with this the house also showcases a spacious open kitchen next to the living and dining area. One of the cooking islands has been used as a partition between the dining and the kitchen, keeping the areas separate. The upper floor of this small house consists of only a bedroom and a bathroom. 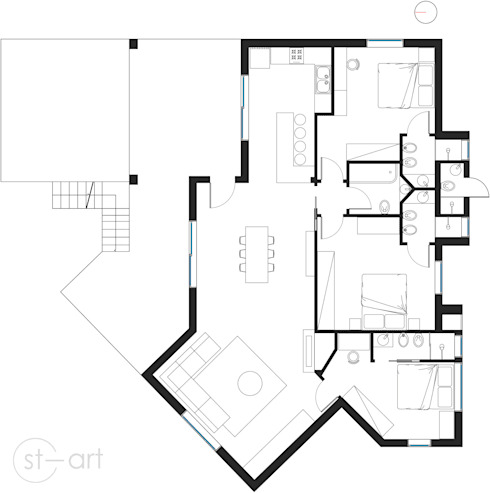 The floor plan showcases how the master bedroom has been separated with the help of an open wall. The area next to the bedroom consists of a small seating arrangement which does not compromise on the privacy factor. The tub and shower areas in the bathroom have been separated from the toilet with the help of a wall. The main purpose of creating this wall was to hide the toilet in a corner so that it does not stand out like a sore thumb. In this picture, we can see the floor plan for a one-family house. The first thing that you notice once you enter the house is the guest bath and study room that is connected to the main living area. This house is also equipped with an open kitchen along with a small dining area. Due to the open construction and lots of windows every part of the house receives proper daylight. Although this house might not look large, it still offers space for everything that a dream house should consist. The large terrace situated on the side of the house gives it a magnificent view. Previously the floor plans of a house were represented as technical drawings. The architects made a lot of effort to draw the exact layout and dimension of a room by hand. But with modern technology, professional work can now be done with the help of computer software. This makes it easy for the buyers to visualize the final product in a much better way. The idea behind creating all the rooms of this house on the single floor was so that people with mobility issues could find it viable. Since all the rooms are on the ground floor, it makes the bungalow look larger than a multi-storey house. Like every other house, the living room, in this case, is also situated in the center. Although this house has a closed kitchen adjoining the dining area it still makes it look spacious. A large utility room has been created next to the kitchen for making it convenient to store your things. While buying a condominium, the floor plans are made according to the model or the design proposed by the architect. But if the house is still in its early construction phase then the buyer is allowed to make certain modifications. 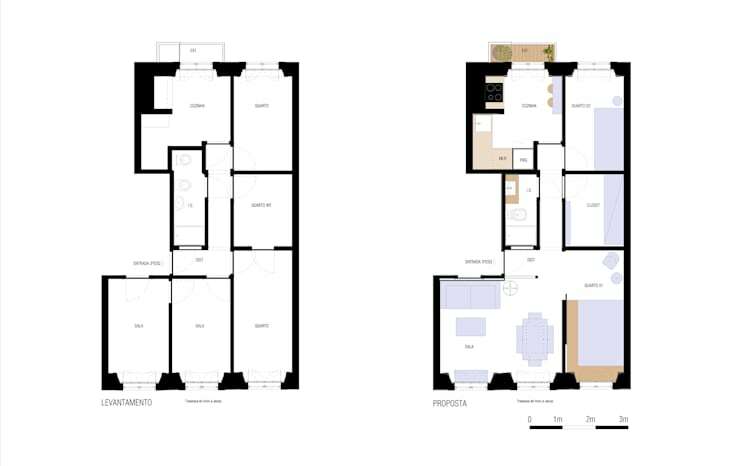 In this example, we can see the before and after images of a condo where three rooms have been combined into a single large space. The owner opted for a more open-plan living space which provides him with more generous living and dining area. Although before the conversion is planned it is necessary to check which walls can be removed. The supporting walls of an apartment can never be removed as it is the primary structure for the upper floors as well. A penthouse which is situated in a skyscraper of a Metropolis is a beauty in itself. Another thing that makes it so great is the terrace which allows you to see the entire city at once. On the ground floor of this luxury apartment, one can find the usual rooms. Along with a sauna room, steam bath, dressing room and a lift that leads directly into the main apartment. The living room that you can see here offers plenty of space for an open kitchen along with different modern design features that you can find in a luxury apartment. Anyone who is spoilt for choice will love the space this apartment has to offer. In warm and tropical parts of the planet, open living floor plans are top-rated. 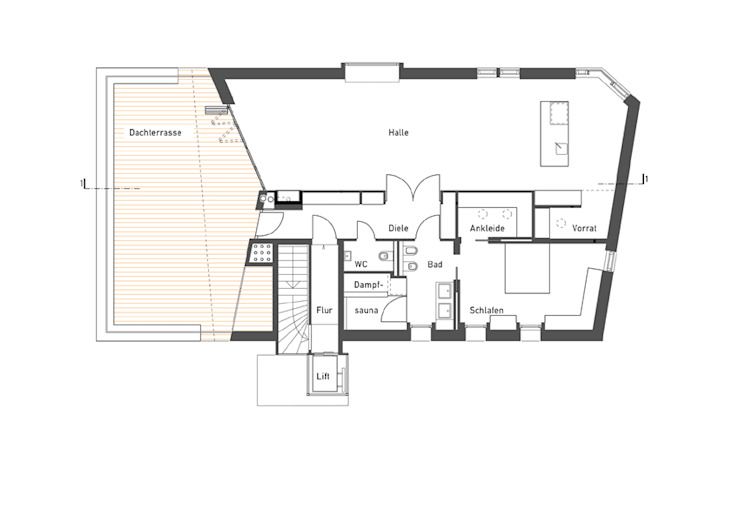 Similar floor plans are partly open so that there is proper ventilation within the house. Areas like the living space, kitchen, and dining are protected by only two outer walls and the roof. 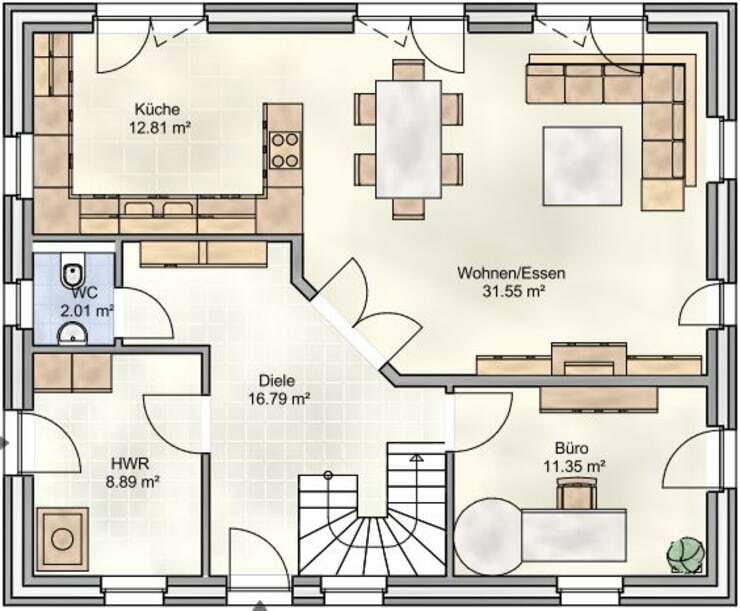 This floor plan showcases a wall of windows which can be opened entirely is required. It would allow you to bring in the good weather into the living space. This beautiful house situated in the south offers a great view from each of its bedrooms. All the bedrooms are equipped with a spacious bathroom and are designed so that they can look at the poolside deck. The rooms can be reached via a long wooden walkway situated at the back of the house. The house has been designed so that it can adapt to warm climate. With the open living and kitchen design, the house can be extended towards the garden. 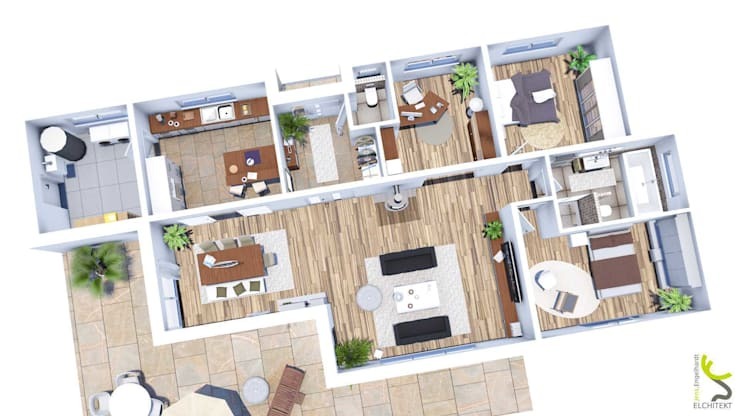 This is a 3D floor plan of a multi-storey house that can be known for its luxurious features. The extraordinary architecture of this villa makes it clear that the design limit can almost never be set. The ground and the first floor of this beautiful villa have the usual living space while the upper floor is covered by a large roof terrace and a fantastic view of the pool. Square designs are practical and good but when it comes to creating an extraordinary living experience the floor plan of your dream house can be anything that you may like. Instead of straight lines, the rooms can also have slanted walls and corners for cozy sofa seating. 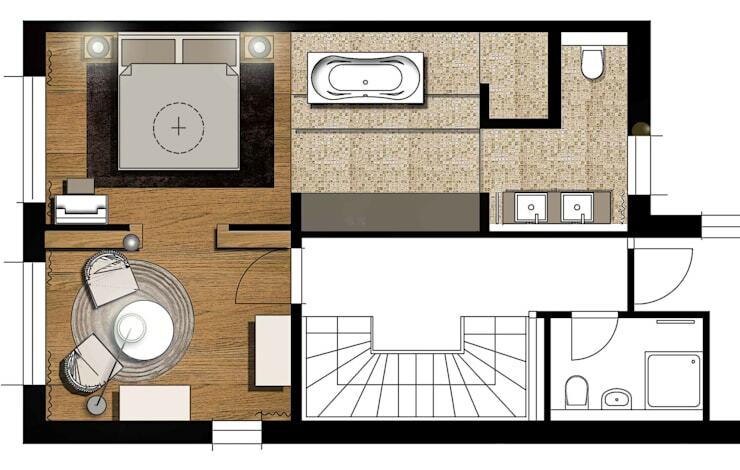 This floor plan showcases a ground level living area which offers enough space for three bedrooms and a living area. Each bedroom has its private bathroom with shower while the family bathroom with tub is accessible from the hallway. Which one of these plans inspired you the most?